Light, after having passed through the vitreous body hits the Retina, which covers the inner lining of the eye. ‘Retina’ comes from the word ‘net’, and it acts like the sensor or film in a camera. The Retina collects the light and starts the chemical process of converting this into signals that our brain interprets as vision. In adults, the entire area spanned by the retina is about 1000 square mm. It has one hole, through which the optic fibers leave the eye to the brain. This hole is what causes the blind spot. The area of this spot is approximately 3 square mm. The most interesting aspect of the Retina, at least for our purposes, is its collection of Photoreceptor cells – the neurons that convert light into signals. There are different kinds of photoreceptor cells, two of which are important to us – the Rods and the Cones. These are spread across the retina, like cheese and toppings on a pizza. It is the distribution of rods and cones that allows us to classify different areas of the retina as shown in the above diagram. The entire retina contains about 7 million cones and 75 to 150 million rods. The question is, if there are 150 photoreceptor cells spread across the retina, then are there 150 million optical fibers going to the brain? No, there are not. There are only about 1 million optical fibers. This means there must be a convergence or mixing of signals. Strange, but our retina compresses the image in an order of 100:1! 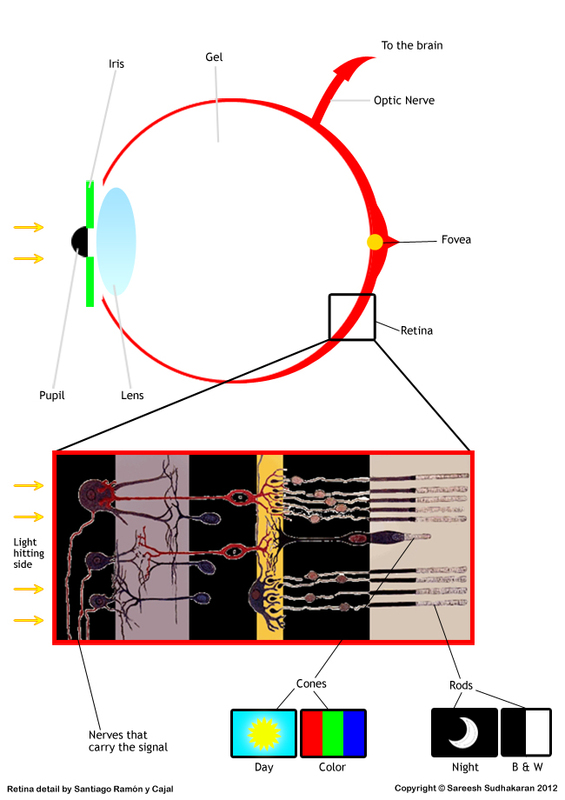 The diagram of the retina also explains our vision – blurred at the edges and focused at the center (on whatever it is we have directed them to). This tells us that the Fovea is the point on the retina that the light focuses on. The concentration of cones increases as we move to the center. As we move to the periphery of the retina, the number of rods increases and cones decrease. The Macula surrounds the Fovea, and is actually a yellow spot that acts like sunglasses for the Fovea, shielding it from bright light. Rods and Cones are photoreceptor cells that behave differently. Rods look like rods and cones look like cones. Simply put, Rods do well under low light and with black and white (slightly blue, actually) color. Cones do well under bright light. Cones are where the color in our vision comes from. This sort of explains how the fovea works (the fovea is free of rods). Under bright light our vision is the sharpest and the colors are brightest. At night, our vision isn’t as sharp and the colors are muted and almost monochromatic. For any activity that needs the sampling of detail, the eye uses the fovea. E.g. reading, driving, etc. The fovea is also critical for color vision and motion detection. 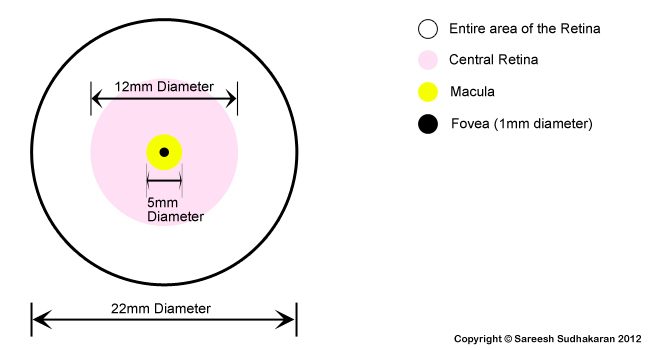 The fovea has a center, too, and it’s called the Foveola – about 0.2 mm in diameter. The size of the cones in the fovea are smaller than the size of cones outside it. This also tells us that the fovea has the greatest resolution within the human eye. The fovea subtends only about 2 degrees of human vision, and even though it is only 1% of the retina, it has access to about 50% of the visual cortex. One funny fact is that you would expect the fovea to be located on the optical axis, in line with the center of the lens, but it’s not. It is actually located about 4 to 8 degrees to the side. Rod cells are sensitive to low light levels. A rod cell is sensitive enough to respond to a single photon of light, and is about 100 times more sensitive than cones. Rods are indispensable for night vision, and are most sensitive to wavelengths of light around 498 nm (green-blue) – the color of night for most of us. This causes the Purkinje effect – which is the tendency for the human eye to shift toward the blue end of the color spectrum at low illumination levels. As can be seen, cone density in the fovea can reach 350,000 cones per square mm. They are typically 40–50 µm long, and their diameter varies from 0.5 to 4.0 µm. The Retina is a net in the inner eye that catches light. The Retina composes of photo-receptor cells. The two most important photo-receptor cells are Rods and Cones. Rods are sensitive to low light and blue monochromatic-type color. Cones are sensitive to bright light and are the cause of color vision. Cones are also responsible for resolving detail and motion detection. The eye ‘compresses’ visual information. How and why it does this exactly is still not very clear. The light hitting side (at the illustration) it is reversed. Indeed, the rods and cones are under the pigmented layer, which is exposed to the light.